When the carbon pollutants excessively build up inside the catalytic converter and reduce its filtering efficiency, that's when you need to look for the best catalytic converter cleaner. The car engines produce harmful emissions like nitrogen oxides, carbon monoxide, and hydrocarbons, which are harmful to the environment. But a catalytic converter doesn’t let these pollutants directly release in the air due to its filtering process. What it does is, it converts engine generated harmful pollutants into less harmful gas through a chemical reaction between metals of the converter and the exhaust gases. But over time, the converter gets clogged due to the carbon buildup and cannot properly filter the car’s exhaust gases. Thankfully, there are cleaning solutions for unclogging the catalytic. 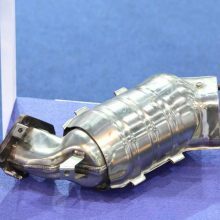 In this article, I will review some of the best rated catalytic converter cleaners to increase your car’s exhaust efficiency as it was before. CRC 05063 Guaranteed to Pass Emissions Test Formula – 12 Fl Oz. 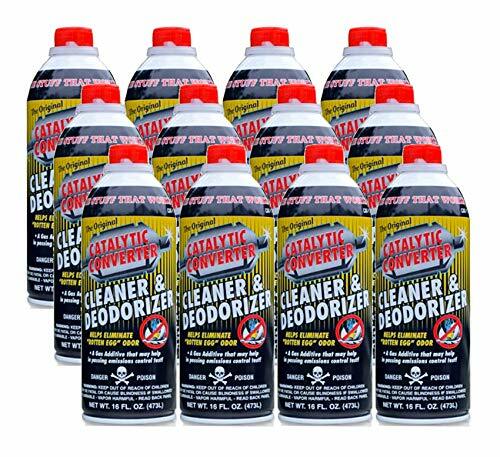 Solder-It (CAT-1) Catalytic Converter Cleaner 16 oz. Why You Need A Catalytic Converter Cleaner? Before jumping onto the main section, let's talk about some of the benefits that you will get using a cleaning solution for the exhaust system. The very first noticeable change you will see after using a cleaner is the engine performance. Hydrocarbons stick to exhaust parts and interrupt their functionality. Here in, a catalytic converter cleaner cleans the exhaust system and improves the engine performance. When the cleaner strikes, it increases filtering efficiency and lowers the amount of emission when it releases. It also increases the engine oil efficiency by allowing it to produce more power with even less fuel. No car owners like it when the exhaust system releases that rotten eggy smell. Luckily, if you use a cleaner, it will make the smell disappear. People who need to drive for long hours, their cars’ catalytic converters get pollutants stuck more than others. It's not something desiring to visit an automobile shop often. Therefore, this cleaner comes with a 3-liters capacity to reduce both the hassles of the exhaust system and visiting a shop frequently. The cleaner is suitable for vehicles run on fuel like E10, E15, E85, and gasoline. A catalytic converter isn't the system itself; rather it's a part of the entire exhaust procedure.Therefore, treating only the converter might help you out for a short time, but in order to ensure the car engine's efficiency, you must also feed other parts as well. 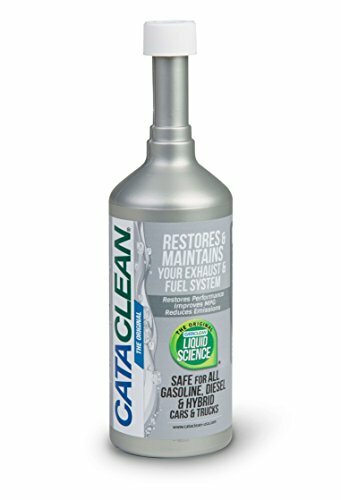 Cataclean seems to understand this issue very well, and that's why they came up with this solution that not only takes care of the converter, but protects oxygen sensors, cylinder heads, and fuel injectors as well. Without a doubt, it can be the best for your vehicle's exhaust department. The second cleaner on this review list is from the brand Mr. Gasket. This cleaner is suitable for vehicles that run on diesel, gasoline, hybrid, and flex-fuel. But it is not appropriate to use for cars with 2-stroke engines. If you are having an issue with emissions of the exhaust system, it can lessen the hydrocarbon pollutants up to fifty percent. 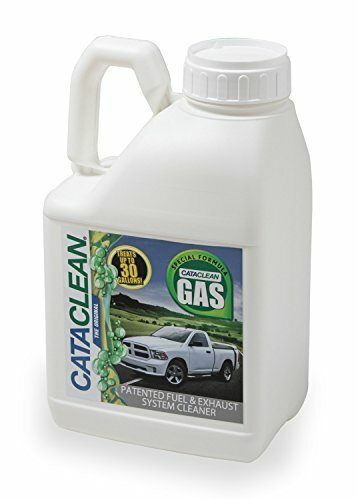 Cheap catalytic cleaners don't provide cleaning in the entire exhaust system.Thanks to this cleaner from Mr. Gasket, that can reduce the carbons from the converter, oxygen sensors, cylinder heads, and fuel injectors too. A clogged converter reduces the overall performance of cars, and that's why car owners use cleaner to increase the engine performance. Apart from increasing the performance, this cleaner also improves issues related to driving such as power reduction, hard starts and rough idle. Furthermore, the fuel efficiency of your car engine will be improved significantly. The next product is from Solder-It. Actually, the package includes a total of 12 cleaners, and each one is of 16 oz. Considering the price, it’s a bit high.But you are getting 12 of them, so worth the money for professionals or if you have multiple cars in your garage. A clogged convert is a reason why your car exhaust system releases rotten eggy smells. This is where this cleaner is great at. Not only it cleans the build-up carbons from the converter, but also its deodorizer function effectively vanishes that rotten egg smell within a very short time. Apart from cleaning the converter and reducing bad odor, it also cleans the oxygen sensor which plays a vital role in releasing hydrocarbon emissions from the exhaust system. Solder-It states that this product may pass emissions control test. But it’s not worth taking the risk. If you live in an area that doesn’t have any restriction using such chemicals, only then you should consider buying it. 4. 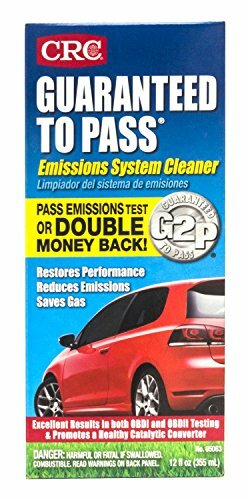 CRC 05063 Guaranteed to Pass Emissions Test Formula – 12 Fl Oz. When it's about emissions test, the car owners almost freak out during that time. If your emissions test is about to happen in any time soon,what about a catalytic converter cleaner that guarantees you to pass the test? Well, take a look at what the reputable brand CRC has to offer for you.It might be that you buy a cleaner, but it doesn't have enough guts to clean the converter properly. This time, give this one a try; it will not let you down I bet you. The cleaner comes with extremely powerful cleaning detergent additives that no hydrocarbons in the entire fuel system have the ability to stand against it. It will clean your catalytic converter like a pro. Besides, you will also see a noticeable improvement in your car engine performance. To keep your engine perform like new and improve fuel efficiency, it recommends using the cleaner for every 3,000 miles. So far, it’s possibly the best for vehicles run on all gasoline and ethanol fuels on the list at this price range. 5. Solder-It (CAT-1) Catalytic Converter Cleaner 16 oz. This one is a single item from our previously reviewed cleaner package from Solder-It. If the entire package of 12 cleaners seems costly to you, here you have the choice to pick a bottle. 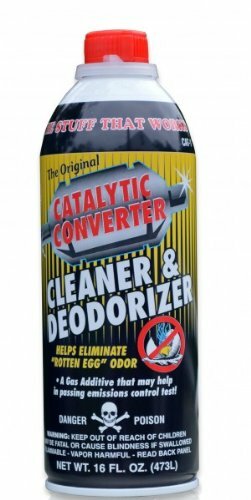 This catalytic converter cleaner removing the rotten egg odors from your car exhaust system. When hydrocarbons build-up inside the cat converter and it puts an obstacle to filter un-burnt fuel, that’s why this kind of smell triggers. But how the odor generates isn’t your headache when you have the cleaner. People reviewed this cleaner with positive feedback due to its amazing work to eliminate bad odor. Besides, it greatly helps cleaning the oxygen sensor as well. However, if your emissions test is going to happen in any time soon, you should go with other cleaner as there is no assurance that this chemical will pass the test. Last but not the least, a cat converter cleaning product from Germany. If you are having an issue with your cat converter, give it a try, you will not regret it for sure. The cleaner can be used for both diesel and gasoline-fueled engines. In my research, I came to know that this cleaner did solve the converter problem of many customers and there weren't much of the complaints about the product. If you previously gave a try to a cheap cleaner and that didn't work out, why not this time go for an expensive one? Hopefully, it would be worth every penny. This cleaner works great at reducing emissions levels. Considering the emissions test, it can be your favorite catalytic converter cleaner. The cleaner is one kind of chemical, and that's why you need to know a few things before you get one and pour into the engine's tank. Don’t fall for a cat converter cleaner until you know whether it is compatible with your car engine or not. Not all the cleaners were made for all the types of engines out there. Some auto cleaners are compatible with a wide range of engines such as 2-stroke, 4-stroke, and engines that run on gasoline, diesel. While on the other hand, some cleaner can be incompatible with certain types of engine. Before buying, head to the instruction first, see if you find your engine type on its compatible engines’ list. They are not just typical cleaning solutions; the bottles are filled with chemicals. Therefore, you need to know whether it will be safe to use in your car or not. Also, make sure the product you buy is environment-friendly. In many states, you cannot use a converter cleaner that doesn’t pass the emissions test. Likewise the exhaust system, there are few regulations depending on the state for using a cat converter cleaner. The manufacturers mention about this thing on the bottle. But if you live in an area that doesn't have any restriction on using these chemical cleaners, you are good to go with anything you like. A catalytic converter isn't the system itself; rather it's a part of the entire exhaust system of a car. If the converter gets clogged and do damage to other parts of the exhaust system, then cleaning only the converter will not help you out regarding the solution you are looking for. So, you need to make sure the cleaner has the ability to work on essentials parts of the exhaust system such as the oxygen sensors, cylinder heads, and fuel injectors as well. But if you are certain that your car is having an issue on only one part, you can choose a cleaner which is good at that part. Using this kind of cleaner is a part of your car maintenance. So, you are going to need the cleaner again from time to time. To save the cost, it would be great if you purchase a multipack that includes dozens of these cleaners. It depends on your pocket. If you have plenty of money to spend on your car, go for the cost-efficient multipack option. However, if you are looking for a solution for this time only, there are a lot of single cleaners to choose from. 1. Can you drive a car with a bad catalytic converter? You can still drive your car with a bad catalytic converter. Only in extreme situations, it might prevent your car from running. However, running a car with a bad cat convert will drop the engine performance, and it will consume a lot of fuel as well. 2. What does a bad catalytic converter smell like? Mostly it smells like burning sulfur. But the smell of rotten eggs is another type that releases from the exhaust system. 3. How often should I use a catalytic converter cleaner? Catalytic converter eventually gets dirty over time. But when people drive thousands of miles without even taking care of the converter and the exhaust system is maintained poorly, this is when the converter gets away too bad. Therefore, the general rule of thumb is to clean your car cat converter with a cleaner roughly after every 3,000 to 4,000 miles. It will keep the converter in a good state. 4. How long does it take to clean a converter cleaner? Driving the car for 40 minutes after pouring the cleaner into the tank will buy enough time for the cleaner to finish the cleaning mission. 5. What happens when catalytic converter goes bad? If a car has a bad catalytic converter, it will show poor engine performance, and the engine would require more fuel than before. Also, the exhaust system will release smells like rotten eggs or burnt sulfur. Cat converter cleaners were born to serve your exhaust system. 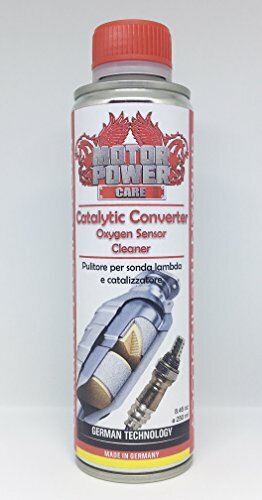 After reading this article, hopefully, you have found the best catalytic converter cleaner for your car considering the engine type and your requirements. Just pour the liquid into the tank and let it handle the rest of the things for you.